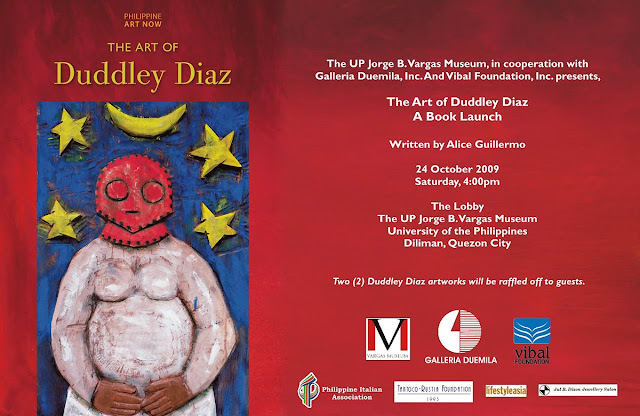 The UP Jorge B. Vargas Museum (UPVM), in cooperation with Galleria Duemila, and Filipiniana.Net (a division of Vibal Publishing House) present the launching of the book, The Art of Duddley Diaz on 24 October 2009, Saturday, 4pm at the UP Vargas Museum. The book celebrates Duddley Diaz’s origins, passions, and wisdom as a child extending to his current status as an acclaimed Filipino sculptor working in Italy. The book is authored by renowned art critic, Dr. Alice Guillermo with an introduction by the Vargas Museum’s current Curator, Dr. Patrick Flores; and a foreword from the National Museum of the Philippines Director, Corazon Alvina. The book complements Duddley Diaz’s retrospective exhibition currently on view at the Vargas Museum. Titled Messenger of the Gods, the retrospective brings together four decades of Diaz’s artistic journey. The repertoire of works is a testament to Diaz’s spiritual background and influences. It upholds his technical prowess in handling different sculptural media, such as clay and terracotta, wood, cast bronze, brass, marble, silver, ivory and ox bone. The exhibit also showcases the scale and character of his works, from large format relief panels to intricately carved ox bone and silver jewellery. The exhibition is on view until 30 October 2009. * Php 1000 per book. There will be an introductory price of Php 800 (20% discount) during the launch. Two (2) Duddley Diaz art works will also be raffled off to guests. For more information, please contact the UPVM at numbers (632) 981-8500 loc. 4024 (UP trunkline), (632) 928-1927 (direct line), (632) 928-1925 (fax), or send an e-mail to vargasmuseum@gmail.com. The museum’s official website may be viewed at www.vargasmuseum.org. The project is also made possible with the support of its major sponsors: Philippine-Italian Association, Tantoco-Rustia Foundation, Jewellery Salon, Lifestyle Asia magazine; and also brought to you by Metrobank Foundation, UP Office for Initiatives in Culture and the Arts (OICA), Furnitalia, Icon Graphics, Ralph's Wines and Spirits, The Museum Café by Café Iana.